Just one visit and you’ll be hooked! The secret is out. Sunset Magazine has proclaimed that Serious Texas Bar-B-Q is the West’s best BBQ… in Colorado, Utah and beyond. 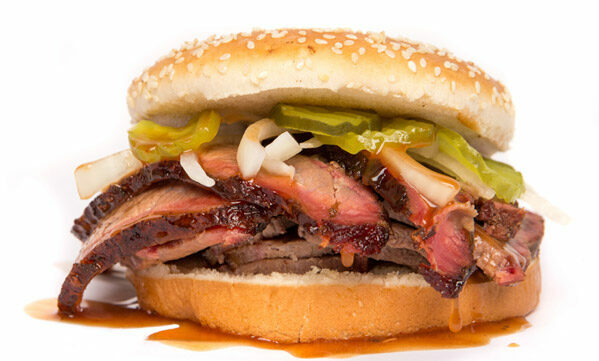 Come join us at Serious Texas Bar-B-Q for great smoked meats, huge sandwiches and legendary salsas. Our meats are slowed cooked on a low temperature for a long time in a wood burning pit which makes them tender enough to just cut with a fork. Try out a pulled pork sandwich paired with our fruity – firey cherry chipolte salsa or a Texas taco with chopped bar-b-q, potatoes, onions, jalapenos and cheese in a soft flour tortilla. Our side dishes are made from scratch including our homemade pies. We/re proud to offer Blue Bell ice cream! You’ll find us right between Fort Collins & Loveland off Hwy 287 at 71st Street and in Fort Collins at 1820 N. College Ave. Enjoy the succulent barbeque in our casual, fun, family atmosphere. When the weather is nice, you’ll feel like you’re eating barbeque outside, as we open our custom designed screen garage doors to let that fresh mountain air in. We also have a nice patio for other dining options. So when you’re hungry for good “Q”, come see us!